I am sitting in my lounge on a corner of the couch surrounded by the contents of my kitchen. 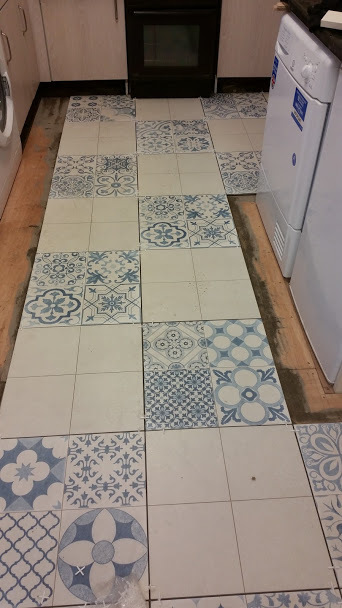 This weekend I was lucky enough that the guys from work had some time to be able to come and tile my kitchen floor. Only when you have to clear out a lot of your kitchen and stay out of it do you realise just how integral that room is to your weekends. Thankfully we have a second kettle from when my daughter was in her own flat so I can have that with me and still get cups of tea when I want. I have of course left the main kettle in the kitchen with the guys. Let’s face it, who do we know works without having a steady supply of tea and coffee nowadays? It’s amazing to see the wear and tear on my kitchen when all the extraneous “things” have been removed and the original vinyl lifted. I think some saving may be in order to allow a new kitchen in the next couple of years. Doors that are not sitting just quite as square as they should be, flooring that has been affected by moisture, things looking a bit worn and just not quite right. I came into this house when it was built, all brand new and shiny. It’s so easy to think it will stay that way forever. Things happen however, leaks and spills, bumps and knocks and before you know it what used to be shiny and perfect becomes worn and damaged. Stupidly we got an interest only mortgage which has now finished and at 53 years of age I am now having to take out another mortgage this time with my daughter as co owner. This of course required a valuation which meant I had to look at my home critically for the first time in over 15 years. Water stains where the bath had overflowed and the water tank had leaked, I remembered those instances. What I didn’t remember was how the door to the hall cupboard had been hit so hard the surface was dented inward. According to my daughter that was when she lost her balance and fell into it. Small parts of beading missing from the lounge laminate flooring and the rather large area in the kitchen floor that had to be replaced when the washing machine leaked. The call went out to my daughter’s friends who thankfully came to our rescue with decluttering and decorating. We made the required value for the valuation with not a penny to spare. I decided that whilst the house was the clearest it’s been in many a year, I would see about getting some improvements made. Hence sitting in my lounge this weekend whilst the very talented guys I work with are tiling my kitchen floor. Fingers crossed it gets finished today so I can get some space back before going back to work tomorrow.